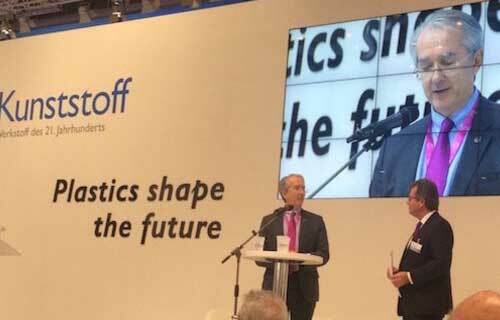 PlasticsEurope chose K 2016 as the stage upon which to place its new Plastics Packaging Circular Economy Group, which will work within the value chain to capitalise on plastics as a resource. Karl-H Foerster, Executive Director, PlasticsEurope, and Patrick Thomas, President of PlasticsEurope and CEO of Covestro, presented the new venture for the first time last week, introducing plastics as a contributor to growth, jobs and sustainability, with a crucial role to play within the Circular Economy, and not just as a material to be recycled. “If managed the right way, I am convinced the Circular Economy, this massive innovation capability in Europe, will contribute to overcoming some of the environmental challenges we are facing,” stated Thomas. “Plastics is already contributing to resource efficiency in the EU and we are still wasting resources that could have a second life. Every tonne of plastics that goes into landfill is utterly ridiculous. PlasticsEurope is engaging with the industry value-chain in realising a vision towards a Resource Efficient European Circular Economy and aims to foster an economy where materials are not landfilled and littered, but are recovered for use in tomorrow’s products or as an energy resource. Plastics packaging plays a large role in the environmental remit for the plastics industry as set out in the Circular Economy, but far from being a sustainability bogeyman, PlasticsEurope stresses the plastics packaging industry adds value to products and strengthens the entire supply chain in a holistic way. The plastics packaging industry delivers innovation the further boosts resource efficiency and ensures recovery at the end of a product’s useful life. “Life-cycle thinking is at the heart of our actions,” stated Foerster. “The Circular Economy proposals should also aim to bring environmental benefits over the product’s full life cycle; it is only through the lens of resource efficiency that new approaches and holistic packaging solutions will be developed. The new plastics packaging group has been established in collaboration with the European Plastics Converters and the Plastics Recyclers Associations for added clout and to represent the industry fully as the Circular Economy’s measures are rolled out. “Our industry is committed to a sustainable future within a low-carbon economy and we will continue to increase our engagement with the plastics value-chain towards this common goal,” said Foerster. When the Circular Economy first released its data, the plastics market disputed some of the information published in the initial whitepaper. Some were ‘informed, while some were uninformed’, Thomas stated, which is why the plastics sector needs to scrutinise and play an active role. Nevertheless, the targets set in the Circular Economy framework set to bring benefits to the sector and the industry leader was confident it marked the next stage in plastics’ evolution.